Floyd County is a county in the U.S. state of Texas. As of the 2010 census, its population was 6,446. The seat of the county is Floydada. The county was created in 1876 and later organized in 1890. It is named for Dolphin Ward Floyd, who died on his 32nd birthday, March 6, 1836, defending the Alamo. Marshall Grain Co. 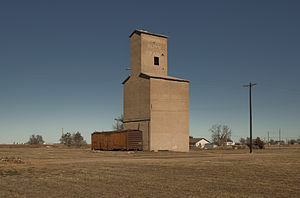 Elevator at Floydada. The Matador Ranch, based in Motley County, once reached into Floyd County as well. Republican Drew Springer, Jr., a businessman from Muenster in Cooke County, has since January 2013 represented Floyd County in the Texas House of Representatives. According to the U.S. Census Bureau, the county has a total area of 993 square miles (2,570 km2), of which 992 square miles (2,570 km2) is land and 0.4 square miles (1.0 km2) (0.04%) is water. As of the census of 2010, there were 6,446 people. The 2000 census showed 2,730 households and 2,110 families residing in the county. The population density was 8 people per square mile (3/km²). There were 3,221 housing units at an average density of 3 per square mile (1/km²). The racial makeup of the county was 74.16% White, 3.38% Black or African American, 0.76% Native American, 0.17% Asian, 0.05% Pacific Islander, 19.66% from other races, and 1.81% from two or more races. 45.93% of the population were Hispanic or Latino of any race. There were 2,730 households out of which 39.40% had children under the age of 18 living with them, 63.90% were married couples living together, 9.70% had a female householder with no husband present, and 22.70% were non-families. 21.30% of all households were made up of individuals and 12.30% had someone living alone who was 65 years of age or older. The average household size was 2.79 and the average family size was 3.26. In the county, the population was spread out with 31.40% under the age of 18, 7.40% from 18 to 24, 24.40% from 25 to 44, 20.70% from 45 to 64, and 16.20% who were 65 years of age or older. The median age was 35 years. For every 100 females there were 93.80 males. For every 100 females age 18 and over, there were 89.90 males. The median income for a household in the county was $26,851, and the median income for a family was $32,123. Males had a median income of $25,487 versus $18,929 for females. The per capita income for the county was $14,206. About 19.50% of families and 21.50% of the population were below the poverty line, including 28.60% of those under age 18 and 16.50% of those age 65 or over. Floyd County is located in what many call the wind corridor of the United States. The wind corridor stretches from the Panhandle of Texas up into Minnesota, including some of the most wind rich states in the country. There are several reasons why Floyd County, Texas is ideal for wind development. Those reasons include the quality of wind in the region, the potential to connect into two different electric grid systems, and the scheduled transmission line build-out in the area.